Fans of Fall Out Boy, get excited!! Your favorite punk-pop band are on tour with their latest album, “MANIA”. Joining them on the massive North American jaunt is Machine Gun Kelly – they’re on their way to the Hersheypark Stadium on Saturday 1st September 2018!! Get ready for an absolutely epic performance – book your tickets NOW while they last!! Since they first burst onto the underground scene in 2003 with “Take This to Your Grave”, Fall Out Boy have influenced the shape of pop punk music. With their debut major label release, “From Under the Cork Tree,” the band became pop icons across the world and started to see the band achieving multi-platinum singles and nominations for Grammy Awards!! What are you waiting for?? 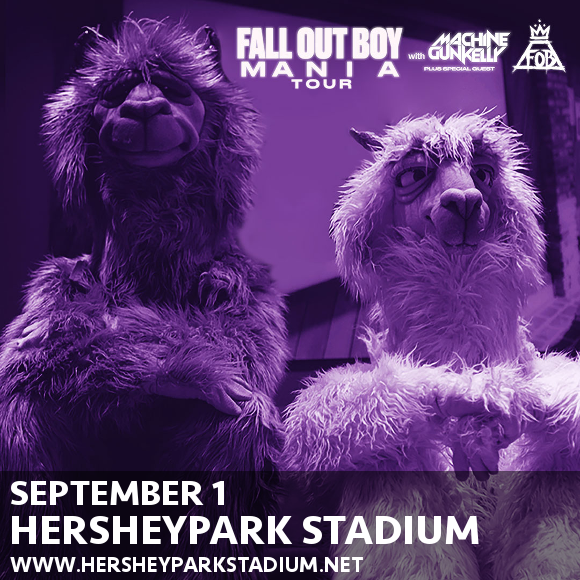 Grab your tickets to see Fall Out Boy NOW, while you still can! !